In France, activities can be undertaken by a sole person (representative, agent), a liaison office or by corporate entities. Popular company forms are the société par actions simplifiée (SAS) and the société anonyme (SA), or the société par actions à responsabilité limitée (SARL). SAS can be formed with a single partner -SAS Unipersonnelle (SASU). – Bylaws : equity, CEO, shareholder’s exclusion terms, majority rules, etc. – Shareholders’ agreements : pre-emption rights, drag along, tag along, vesting, non-competing term, bad leaver, etc. – Consider if applicable, obtaining money in the following order: loans, prices, subventions (BPI, Réseau Entreprendre, Scientipôle, etc. ); love money; business angels; crowdfunding / institutional investors. Branch : Branches enable foreign companies to establish a foothold in France for a commercial activity. • Branches are headed by a legal representative, functioning like an agency and reporting to headquarters, and have no official restrictions on their decision-making powers. • They may carry out all the operations of an industrial or commercial company, but are not separate legal entities and the parent companies are responsible for their initiatives. • Subsidiaries can enter into agreements on sales and technical royalties, commissions, etc. B. 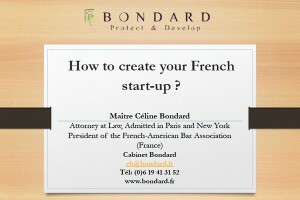 How to register your trademark in France ? • The French IP Office is the Institut National de la Propriété Industrielle, commonly called the INPI. • All processes are available online. • It’s strongly advised to order a search trademark report to evaluate the risk of seeing your trademark opposed by a third party. • Refusal of the registration of your trademark will occur in case of likelihood of confusion. Cow ”, under the ground of likelihood of confusion. • You can register an European Trademark before the European Intellectual Property Office, the EUIPO. • Your European Trademark will be protected in all the Members States. • Third party opposition has to be introduced before the EUIPO. • Once your trademark is registered in France, or in the European Union, you will be able to extend its protection internationally before the World Intellectual Property Office, the WIPO. • The extension is possible through the Madrid System, covering most foreign countries. A. How to negociate contracts in France ? • When negotiating with public entities, you may want to quickly distinguish for yourself the “deal breakers” from the smaller points. • Factor in the duration of the negotiation, which may be quite long (internal company processes). • You want to start with a position that is not going to be too far off, so that you can find a middle ground. • The stakes may not be as high as in the U.S. because litigation is less costly (for instance, limited discovery process). • French courts consider that, during the negotiation phase, parties are free to negotiate, but bound to not abuse of this right. • It is under this criterion of “abuse of right”, that a party can enforce the contracting party’s liability during a negotiation. • One of the major novelty of the contract reform is the introduction of good faith during the negotiation of contracts, and not just during the performance of contracts. • Parties can now be obliged to disclose some information during the negotiation to ensure the contracting party to be fully aware of the legally binding effects of the agreement. B. Important causes under French law. • Termination with fault: one shall provide the other party an opportunity to cure in case of breach (New article 1126). • Termination generally takes place 15 to 30 days after the breaching party has been told of its faults in writing. • Unless: the fault has been so significant that you can consider terminating the contract immediately and without notice. • This unilateral termination, triggered by a formal notice, is made under the demanding party’s risks. • In the event of litigation, you shall have to prove the severity of the breach so best (i) to have a detailed contract; (ii) to have kept evidence of such significant breach. • Termination without fault, it is important, notwithstanding what the contract says, that the party terminating the contract considers what would be a reasonable notice. • New Article 1210 and 1211 of the Civil Code prohibit perpetual undertakings and require that where a contract is concluded for an indefinite duration, a party may put an end to it by complying with the notice period that is specified in the contract, or, if no such provision is specified, by applying a reasonable notice. • Criteria for a reasonable notice may be, notably: initial duration of the contract; financial stakes and economic dependency between the parties. • U.S law allows parties negotiating a contract to minimize their liability for direct damages by enforcing a liability cap. • Clause must be incorporated into a contract at the time the contract is made. • It can be a specific dollar amount (e.g. $200), but it also can be an amount paid for products or services (e.g. the wholesale cost or twice the subscription fee). • CASE: Food Safety Net Services v. Eco Safe Systems USA, Inc., 147 Cal.Rptr.3d 634 (Cal. Ct. App. 2012). • Any mitigation (cap of liability) regarding these damages is not enforceable under case law. • Indirect damages are never compensated as a principle under French law. different types of damages such as lost profits, lost revenues, damages data or business interruption. operating deficit, the bank charges. All those damages must be compensated. (Cass. Com. 14 septembre 2010; n°09-69.036). – have provided the partner the opportunity to familiarize itself with the customer’s activity and needs. • Furthermore, several types of warranties are non disclaimable. which it was intended, or which so impair that use that the buyer would not have acquired it, or would only have given a lesser price for it, had he known of them. • French exception: in case of contractual relations between two professionals of the same field of specialty, clauses limiting warranty shall be admitted. • Warranty of conformity to the documentation’s specifications and to the administrative and legal regulations. • Limit: the consumer has a time limitation of 2 years from the delivery of the object of the contract. • Conformity is evaluated according to the contract established by the parties. • For contracts concluded between professionals, the vendor is held by a warranty of delivery. • Consumer is able to trigger the vendor’s warranty of delivery, in case of a failure to the warranty of conformity. • Standard clause when negotiating in France would be to plan for French law and the competent courts of Paris, France. • Keep in mind when you negotiate that this would actually be the first point of negotiation: if French law is applicable, then all the points mentioned previously shall apply as well. • Litigation, arbitration or mediation are all possible in France; some courts may also push for mediation. • If seeking to include an arbitration clause in France under French law, also consider the venue and the applicable procedural rules, number of arbitrators, fees and costs. • Popular arbitration forums in Paris are: the Chambre de commerce internationale (CCI); Centre de Médiation et d’Arbitrage de Paris (CMAP); l’Association française de l’arbitrage (AFA). • The most common form of employment contract is a permanent contract (contrat à durée indéterminée – CDI) . • An employment contract must stipulate the employee’s pay and job description, along with the working hours and place of work. • The contract may also provide for a probationary period, which may be as long as four months for a managerial post (renewable once if an industry-specific agreement allows this). • All additional contractual clauses shall abide by the French Labor Code or to any industry- specific collective agreement that applies to the employer. • Beyond Labor regulations, employment relations within a given company are increasingly based on collective agreements at industry level and at the level of individual companies. • The company’s actual activity, as stated in its articles, determines which collective agreement is applicable. • You may also want to enter into an agreement with a partner with a services agreement, without having to employ that person. • Beware of: situations where the contract resembles an employment relationship. This contract may allow your partner to ask for a requalification of his or her contract into an employment contract. • Be aware that French law favors employees and consumers. • Negotiate with a lot of attention all your contracts, partnerships or employment contracts. • Keep in mind that the contract shall (i) conform to French law; (ii) be deemed not to constitute an abuse of right, or take the risk that your clause or contract may be invalidated by French courts.